I volunteered at ElephantsWorld (EW) because a friend told me I had to. I casually told her that I was planning a trip to Thailand and before I had finished my sentence she told me I had no option of not going to ElephantsWorld on my travels. She told me it was one of the most amazing things she had ever experienced and the best part of her travels in Thailand; turns out her sentiments were well founded and shared by myself. I was fortunate that just as I had planned to be in the Bangkok area ElephantsWorld had a spot open for a volunteer. I had emailed the admin staff a few times back and forth and once the timeline worked and they said I could come I was on the first train from Bangkok to Kanchanaburi, and then on the EW morning bus out to the sanctuary. My previous experience with Elephants had been similar to most: I had gone to the zoo, and had seen their Elephants off in the distance, separated by a large fence, then a ditch, and then another large fence. 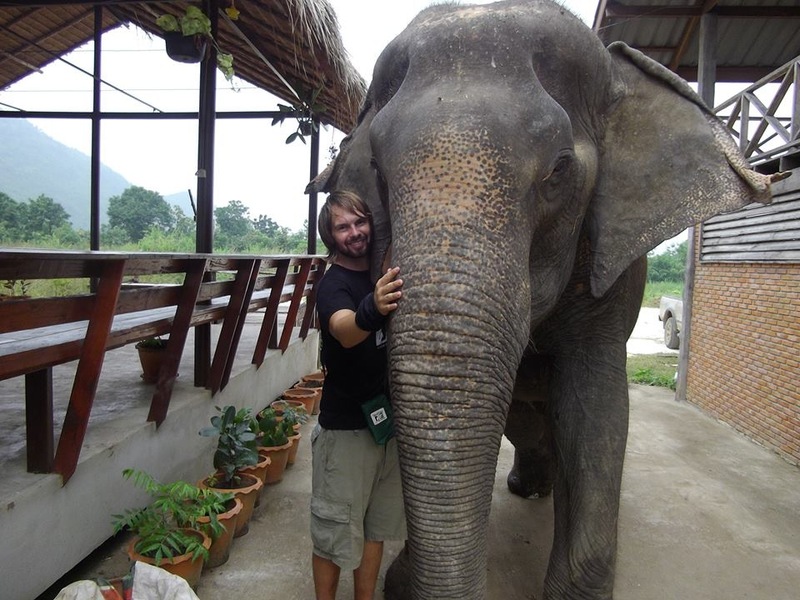 As anyone knows that has visited EW within your first 20 minutes not only are you standing next to an Elephant, you are feeding them and hanging out with them, and being overwhelmed by them. It is an incredible experience that is a one of a kind memory for tourists, and only gets better as a volunteer. The first day I spent as a visitor, I went through the program not quite understanding yet that everything I saw I would soon become an integral part of. Volunteering at EW is not an experience, it is a lifestyle change. At many places when you volunteer you will help out on the periphery if there are extra jobs to be done. This is not the case at EW; once you become comfortable with your duties you become a part of the sanctuary, and it won’t run without you. It is at first a daunting thing but very quickly becomes a fulfilling one. As you get more comfortable you can accept more responsibility and you really do feel like you are making a contribution to the welfare of the giant Elephants wandering around you. It can be hard work, and long days, and at times you will be tired…but it also can be amazing, and life-altering, and can help you develop yourself and your connection with the natural world around you. The duties change from volunteer to volunteer and from day-to-day. 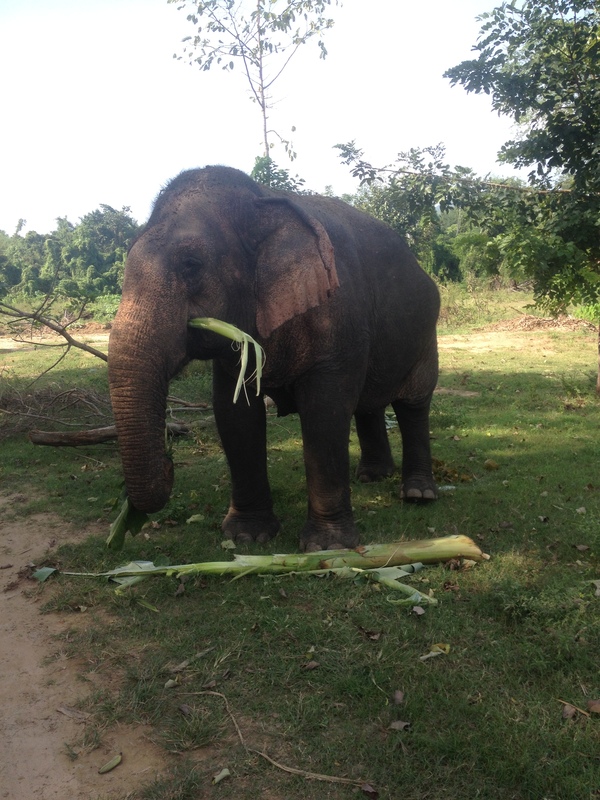 In the morning often you will be packaging food for the Elephants (which includes trying to convince 77-year-old Aum Pan that she should wait until her food is ready….and should not simply help herself in the food shed). Then during the day you’re either guiding visitors, which I will talk about in more detail, or will be helping with day-to-day operations like social media, managerial stuff, or if everything is done means you can just hang out and watch the Elephants. At nighttime you make sure everything is squared away, and then you just hang out with the other volunteers and mahouts. I should also mention that the food is fantastic. Some of my best meals in Thailand came from the kitchen ladies at EW, every meal was highly anticipated by this guy. There are also other non volunteer things that pop up and are awesome; the Sunday local market in Lad-Ya, the going away parties, the local festivals. I wont go into any of these in detail, so you can have the fresh experience all to yourself when you get there. 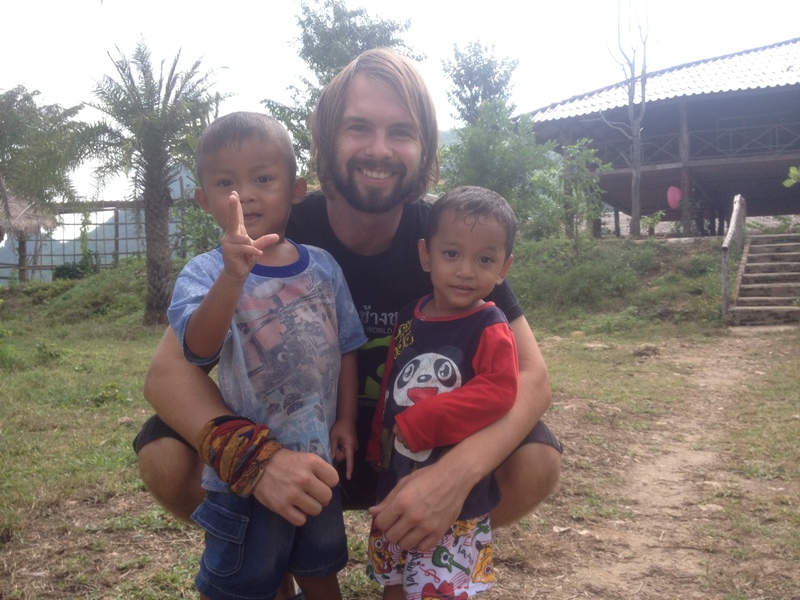 Volunteering here gave me memories I can guarantee I could not hold otherwise; I was playfully chased by one of our teenagers Kam Kaew while I tried to sneak past her with food. 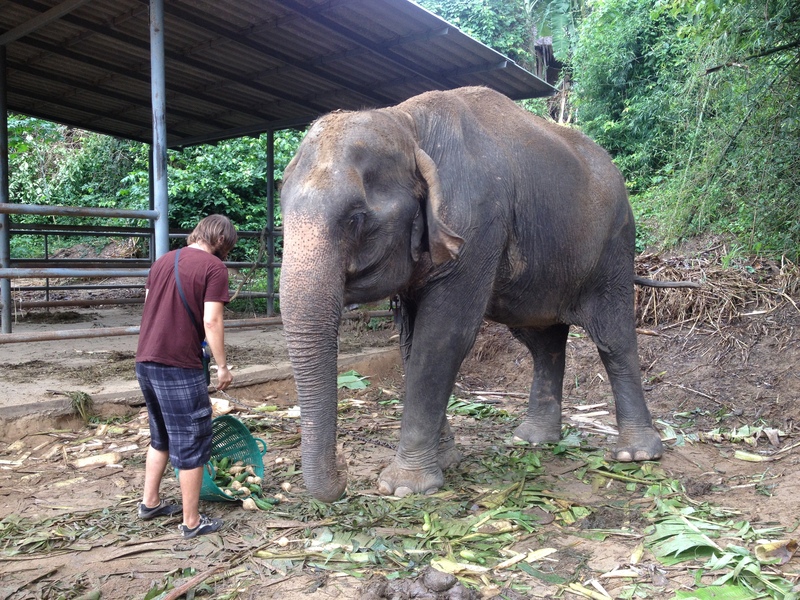 I was picked to feed our blind Elephant Lam Duan at night-time. Lets just say she is lightning fast and once she smells you and her food; she wants to get close right away, in the dark. I had countless tug of wars with our little guy Johnny, his record stands yet undefeated. I also had some surreal moments just watching all of them go about their daily business; oblivious to the Canadian guy sitting awestruck 50 feet away. I met a great group of people; all with their own personal strengths that they brought with them as volunteers. It was also my fortune to stay for 5 weeks and spend 4 of them as the head volunteer; which helped me progress my own leadership skills in a very real way. The mahouts always kept things lively: mahouts are the Elephant cowboys. They each work individually with an Elephant and some have been with them for 3+ years. They all live on-site with you; and so you’re living with them. You’ll get to learn a lot about their culture and their style of life. You will also get to have a ton of fun with them during the day and after the sanctuary closes. I met some great guys and girls who live and work there that I am looking forward to seeing when I return. 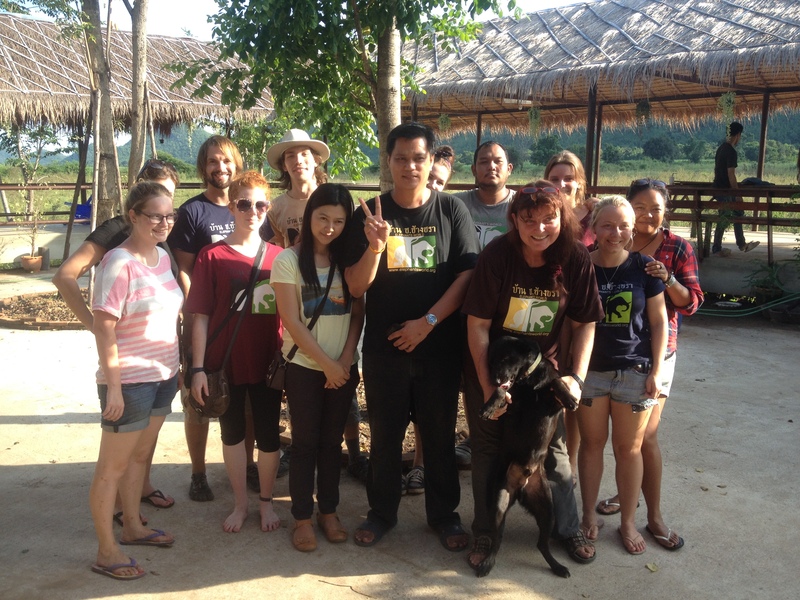 The visitors to ElephantsWorld are also a rewarding part of the experience. One great thing about EW is that tourists who come to it, fully knowing it is a sanctuary and not a tourist trap, are all good people. They get it. They are so keen to learn about the Elephants and are so exuberant in their desire to help out. It was such a cool feeling to learn all about Elephants as a species, and then to pass that knowledge on to people who are really stoked to learn about it. When you volunteer at EW you’ll be amazed at how much you learn, and how fast you learn it. Often people in the tours would laugh when I mentioned I had zero background in Zoology or Elephant welfare; because I had been answering their random questions about Elephants all day. I would usually offer a free water bottle to whoever could stump me first. No mention that water bottles are provided to all the tourists…free of charge. You don’t just learn facts about the Elephants, you learn about the Elephants themselves. They are not a separate attraction like in a zoo; they are as much your friends and colleagues as the Mahouts are. You get to learn which Elephants have no problem with a group of strangers being brought up close to them; and which would rather not. By the end of 5 weeks I could usually tell if one Elephant was just having a bad day, and would just steer the tour away from them to give them some peace. You get to feel that some of them like you, and some of them could care less, and some don’t like you at all. I think Aum Pan liked me, Kammoon would acknowledge my existence from time to time, and Wasana was not my biggest fan haha. Lam Duan was more than happy to have me as a mobile feeder during the night-time. I can’t tell you how cool a feeling it is to know an Elephant. That is something a volunteer has to experience for them self. I started this by saying humans need ElephantsWorld and that I would explain what I meant, well I am a man of my word. Later in my stay I had a morning off to do whatever I wanted. So I did whatever I wanted. Part of that included finding a secluded bench overlooking the river and letting my thoughts wander as they wished. Bear with me here, there is a point. I was watching this giant butterfly float from flower to flower and I started thinking about the difference between it and myself. Namely how it operated with zero care that I was watching it, but how I was sitting there captured in what it was up to. This led me to a realization: that of every species on the earth, the only one that has the power to be benevolent and go out of its way to help all the others is humans. We have the ability to pick any species, and make it’s life easier if we choose. We’re alone in this ability: A dolphin can’t wake up and decide he’s going to plant trees for monkeys, an ant can’t stroll out and give medicine to a stray dog, and that butterfly can’t make sure a lake is clean for fish to live in. Humans can, we are the only ones….and so far, we’ve blown it. Almost every species, maybe every species, has been affected in a negative way because of us. We are the only ones who can make a difference, and we are the only ones who haven’t. I then however, looked around me, at where I was sitting and what was going on around me. I was on a bench, at a sanctuary for old and abused Elephants, a place that lives each breath with the intent to help out another species that should never have been subjugated in the first place. When you get to know Elephants personally as a volunteer, you’ll know what I mean. ElephantsWorld is like a huge billboard to nature saying “I’m sorry, we’re sorry, and we’re trying to make it better.” It is going out of its way to correct the mistakes that history has made before its existence. Our species needs places like ElephantsWorld, it needs beacons of hope that show that somewhere, someone is trying to do the right thing. That our species can indeed, wake up in the morning and be a positive inhabitant on the planet, not one that the planet would be better off without. The world needs to become a sanctuary for itself, and it needs human beings to build it, and it needs places like ElephantsWorld to show us how. Humans need ElephantsWorld. I am more than proud that I was a part of it for five weeks, and it was an honour to do my best to help EW breathe a little easier, and to be a part of something truly good. I wish any prospective volunteer all the same life-enhancing experiences I had while I was there. Volunteer elephants, thailand, volunteering. permalink. Wonderful story and memories. Thanks. I don’t really go for the bucket list kind of philosophy but this would be one of my dreams.